So I’m doing my daily beach walk this morning and right outside my house on the beach someone built a volleyball court. You have not seen real volleyball played until you’ve seen me spring up and spike that ball. I think I’m going to go home early form work today and see if I can round up a game with some of the other dogs on the beach. You can catch the picture attached of me checking out the court. At work we are crazy busy as usual with a lot of courses going on right now. Tomorrow we have 7 open water courses going on with Axel and Joe, and have Stella taking the fundivers, Tao has discover scuba divers and I’ll be holding down the office. Monday we have 10 open water courses going on already. I had better get some time for my volleyball!! The weather today held up again. For 3 days now they have been calling for rain and I still have not seen any yet. Tomorrow they say maybe some rain and a little bit of waves, but who knows. I guess we’ll see when I wake up. Hey, I was just checking out my new house which should be done in about a month and found out that the neighbors across the street have 5 cats. I am gonna have a ball with this. I may never go back to work. Speaking of work, busy again today where we had boats to Koh Tao and Sail Rock and same again tomorrow. In fact we have a diver tomorrow who won a free dive from the Dayna fundraiser we had a few months ago. I guess they waited till the last-minute to book their dive. So tomorrow we have Joe, Stella and Tao on the boats with Axel starting a big group of open waters and Eric taking care of some last-minute stuff before high season really hits. Looks like my boat will be finished in about 2 weeks and then finally I can get diving everyday. Maybe we should let the cats on the boat too. Naaaaaah. Well, the rain held off today, but they’re are still calling for some rain the next few days, so I hope they are wrong with the forecast like they usually are. What a crazy day here at Discovery Divers. As you can see by the picture, I started off my day as usual drinking all of Ead’s coffee as soon as she turned her back to talk to a customer. I don’t think she is ever going to learn. It was non-stop customers coming in today and booking diving, discover scuba diving and courses as well as even booking in advance for try dives tomorrow in the pool (with me of course). My head was spinning as well as my tail! Also, my buddy Joe cam back from Bali today and showed me his incredible pictures from his trip. I’ll share a bunch of these with you below. We ramp right up tomorrow with boats going to sail rock and to Koh Tao. Eric, Claudio, Axel, and Joe are all on the boat and Stella will be in the office and I will be out at the pool doing try dives. The weathers gonna turn a little bit with some rain coming in the next few days, but who cares? We’re gonna be wet diving anyways. I’ve got to get back to work as more customers are coming in now. Another beautiful day here in Koh Samui and another great day at Discovery Divers. We were fully booked today suing two boats to go to Sail Rock. 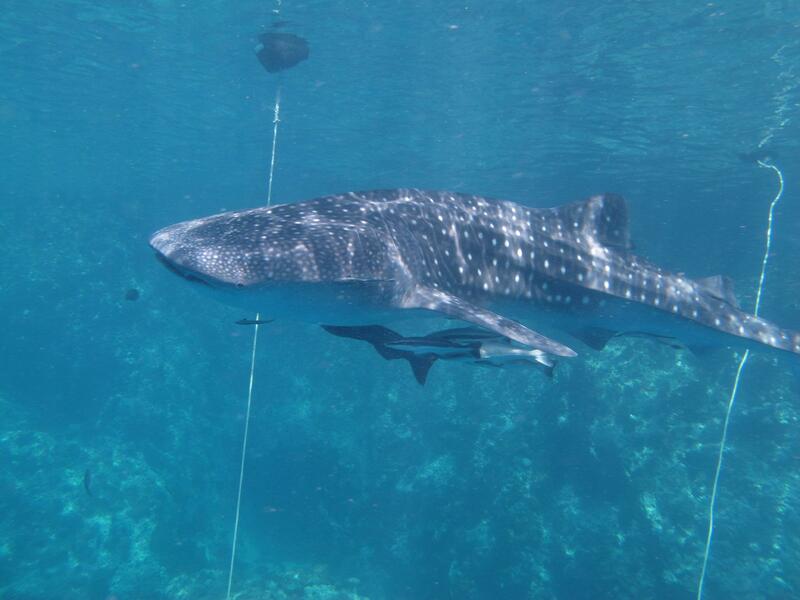 Unfortunately there was no whale shark today. I am to blame for that one. The guys told me yesterday to make sure I call the whale shark and tell him to meet us at Sail Rock this morning, but I got distracted by some garbage cans to tip over and forgot to call. Sorry guys. Tomorrow we are off with another big group to Koh Tao. The weather will be great and should be flat seas so I am sure it will be a great day. Congratulations today to Anaise and Mark on completing their open water courses and to Linda on completing her scuba diver course. We are very proud and happy that Linda really enjoyed the diving once she got in the open water. A lot more fun than in the pool. The weather still looks real good coming up with high temps in the low 30’s for the next few days and no rain in the forecast till at least Friday. Another day stuck in the office working and not diving, but at least I am reading all of my e-mails about boat designs and names. Sorry, but I think “Aquaholic” and “disco dog” are not gonna work but keep trying. Another busy day here at Discovery Divers. We have a boat out to Sail Rock and hopefully we will see another whale shark today while diving. Tomorrow we got a huge group of people going to Sail Rock. I think everyone wants to see the whale shark. or they’re just finding an excuse to come back to the shop and play with me. My buddy Joe is still in Bali and the other day he told me he saw 14 dolphins and 5 manta rays while diving. Hey Joe, lay off the drugs!! Maybe he did see that. i saw 20 dolphins, but that was at Sea World of course. Today we have a high temp of 34 and bright and sunny. The next two days are supposed to be the same. Great weather for diving or working on my blog I guess. As far as my boat goes, keep the ideas coming for names and designs. You can e-mail them to Stoli@discoverydivers.com. Here are some pictures from yesterdays dive and of course me working on my blog. Woo Hoo!!! What a great day. So my lawyer called those guys from Stoli vodka about using my picture and name and threatened to sue the pants off of them. After negotiating all day, the Stoli vodka people asked what it would take to make this go away. As you all know I have been trying to raise money for my own boat to go scuba diving with. So, we settled that the vodka people are going to buy me a boat and supply my dad with 100 cases of Stoli vodka. So I get my boat, but there is no way I am letting my dad drive it with 100 cases of vodka around. I am so excited that in a few weeks I will get to go diving everyday, and then I can kick people off of my boat because they smell. Hahahah, my turn folks. With the boat coming soon, now I have to figure our a name for my boat and a design to paint on the side. Discovery Divers (my company) said that they will run a contest and get some ideas. If they choose a name that you submit, which you can on the comments part of this blog, then you will get a 3500 gift certificate to use at Discovery Divers for anything you want including dive trips and equipment. If they choose a design that you submit for the boat, then you will get a 5000 gift certificate to use at Discovery Divers. You can submit your entries either herein the comments, or you can e-mail them to Stoli@discoverydivers.com. The contest will run for one week and we will announce the winners next weekend. The weather is great again and looks like clear skies and hot weather for the coming week also. WTF is this? So, if you’ve been following what has been going on here. I have been trying unsuccessfully to find a second job to raise some money to buy my own boat so I can go scuba diving without anyone kicking me off the boat for the various reasons (doggy breath, dirty paws, peeing on the boat, etc.) and finally gave up last night. So I’m at the bar last night drinking away my sorrows and order a vodka on the rocks. This guy pours me a drink from a bottle with my picture on it. I find out that some scumbag company put my picture on a vodka bottle and had the nerve to even name the vodka “Stoli” I can’t believe it! Well, of course a call was made first thing to my lawyer Tong Naam, who is one of the best dog lawyers in Thailand. We are going to sue the pants off of these guys for using my picture and name. I also found out that they’ve been doing this for years. I’ll keep you guys informed with what happens, but until then, please refrain from drinking any Stoli vodka as you may be breaking the law and I may sue you also! Other than that, Discovery Divers has been crazy busy as usual. Today we were out to Koh Tao with some Discover Scuba Divers, fun divers and scuba review. Tomorrow we are off to Koh Tao and Sail Rock again with full boats. We have Eric, Axel, Claudio and Tao on he boats tomorrow. How bout me guys???? The weather here was another hot and sunny one with more of the same all week. I know I am starting to sound like a broken record.